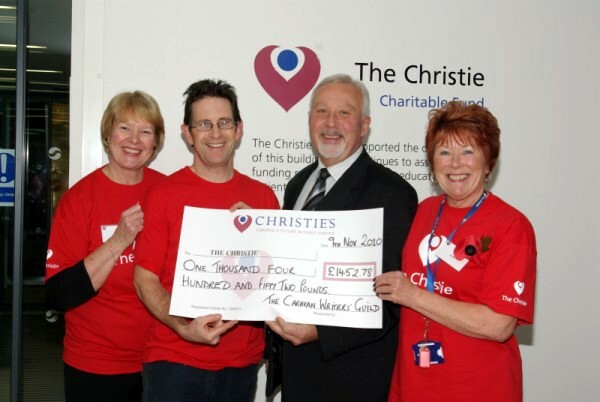 The Caravan Writers’ Guild Chairman Nigel Rosser presented a cheque for £1,452.78 to The Christie cancer charity at the Christie hospital in Manchester on November 9th. The money was raised from the Chairman’s charity raffle held at the CWG dinners in February and October this year. The presentation was made at the opening of a new £35 million patient treatment centre. £9 million of this cost was met from charitable donations. £9 million of this cost was met from charitable donations with the money being used to fund those items that the NHS will not fund. These include a new radio-pharmacy, communications skills training for nursing staff, a new state-of-the-art surgical robot, groundbreaking cancer research and a wig service. The centre houses the largest chemotherapy unit in the UK and the largest phase one clinical trials unit in the world. Phase one trials are those where the drugs are so new they have not been used on humans before. The centre will treat 700 chemotherapy and clinical trial patients each week. Pictured below with Nigel Rosser are Deputy Appeals Director Lesley Birkenhead (left), and community fundraising officers Howard Newall and Jackie Plant.